midtskogen,wow that is very impressive what going on in norway this year! btw midtskogen, if you want to join SE discord server, we will be glad to see you there! it is more active than here now i think and lot of memebers there and staff. I have a fascination for nature, and technical stuff, which leads me to somewhat nerdy projects. Warmest May in Oslo for at least 150 years, by far. My weather station has been running for 16 years. The warmest May I had ever recorded, until this year, was 11.0 °C (the coldest 7.0 °C). The mean for May this year just in: 14.9 °C, shattering the previous record by almost 4 degrees. Wow. Yesterday the high reached 28.7 °C, also a record for May. And May began with fresh snow and I was skiing on 1st May. Same here, sadly. Minneapolis had its earliest-ever 100F reading on record. It also coincided with the AC at my workplace breaking down. Temperatures in the kitchen were 104 by the 3pm hour. Source of the post Temperatures in the kitchen were 104 by the 3pm hour. Yuck! I could barely stand to be outdoors in that heat, let alone have to work in it. Over my way we've had a very warm and sunny May. It's been gorgeous but I hope we get a good period of rain before summer arrives. Couple years ago it was like this from May through September and it stressed the trees pretty badly. Sunny days in my part of Sweden for at least four consecutive weeks now. No end in sight. Warmest May since the 1930s I believe. And it's been hot for so long now that I can't quite believe that I did this in the forest outside Oslo exactly one month ago on 1st May. I hoped for cooler wet weather, and I got more than I bargained for. Snow is coming to the mid elevations (~1200m). In June! Very unusual to get snow this low this late in the season. Source of the post I hoped for cooler wet weather, and I got more than I bargained for. Snow is coming to the mid elevations (~1200m). In June! Very unusual to get snow this low this late in the season. It's gonna be Christmas in July! After an extremely hot May Scandinavia is now divided. Still mostly very warm in the south, and cold in the Norway with snow even at sea level. Which isn't unheard of in June, but quite unusual for many days in row as now. Oslo has seen temperatures between 2 and 32C so far in June, either end quite close to as far as it can go in June. 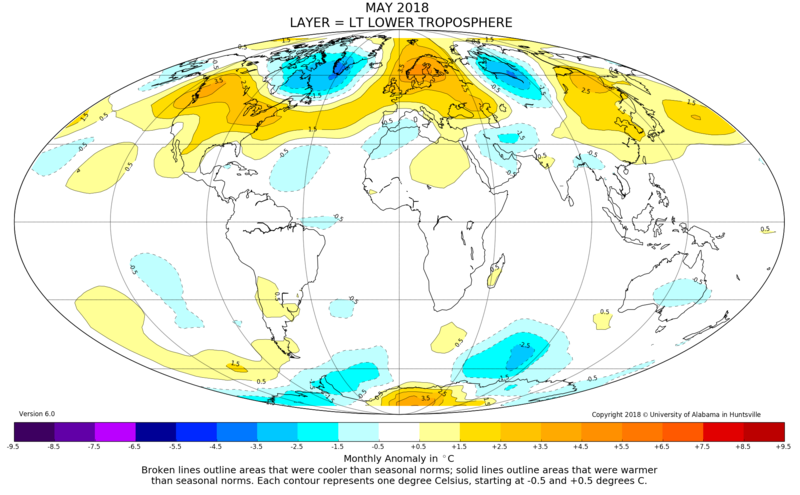 The lower troposphere in May as measured by satellites had a hotspot in May. For the NH it came out as +0.40C above the 1981-2010 mean, and -0.05 for the SH. I woke up to this today. Thunderstorms are not unusual this time of the year, but this is definitely one of the stronger ones. As you say, thunderstorms are common in that area during summer, but that looks intense. 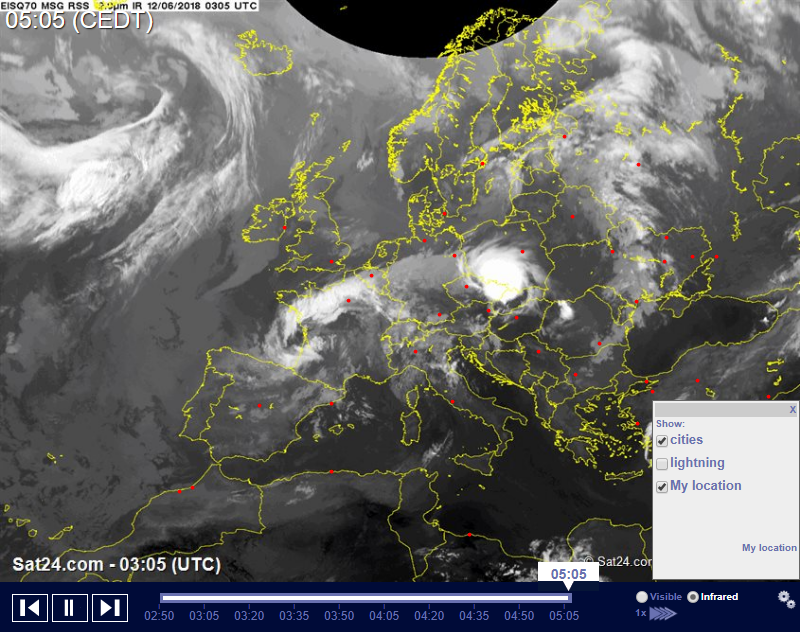 I'm going to the Holesov area next month, which looks like pretty much ground zero of that storm. It also lasted long. 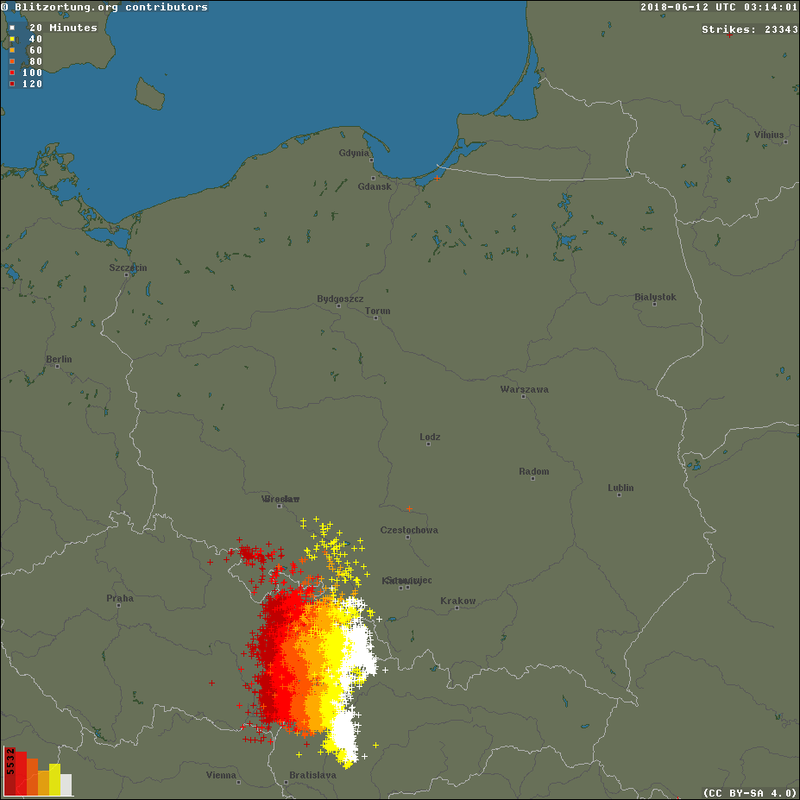 Formed in the German Alps and over the night, traveled about 700 kilometers northeast before dissipating in the morning. It's pouring and it's sunny out! there is only one tiny cloud above my lab and it's producing a awful lot of rain. There are more clouds coming my way, but they're not here yet, so it's just this one little cloud!